Your office copier is just one of the many moving parts that helps keep your business up and running, and you’d like to keep it that way, right? What happens when you start noticing changes or problems in your office copier? Do you ignore them, hoping they’ll go away? 1. Improved Print Quality refers to the hard copy or print produced by a printer. 2. More Optionsand newer technology increase productivity. 3. Enhanced Cybersecurity helps keep your business safe. 4. Reduce Service Calls to save time and money. 5. Business Growth promotes higher print volumes. Depending on the specifics of your office copier, such as how old it is and how frequently you use the machine, it might be time for an upgrade. Even though replacing your outdated office copier with a more modern piece of equipment can seem unnecessary, doing so can help optimize your workflows while also improving your overall office productivity. When was the last time I upgraded my office copier? Was it over five years ago? Has my printing volume increased over the past few years? Has my business grown/have I added more employees to my team? What issues bother me the most about my office copier? What are the most important things I’d like my office copier to have? 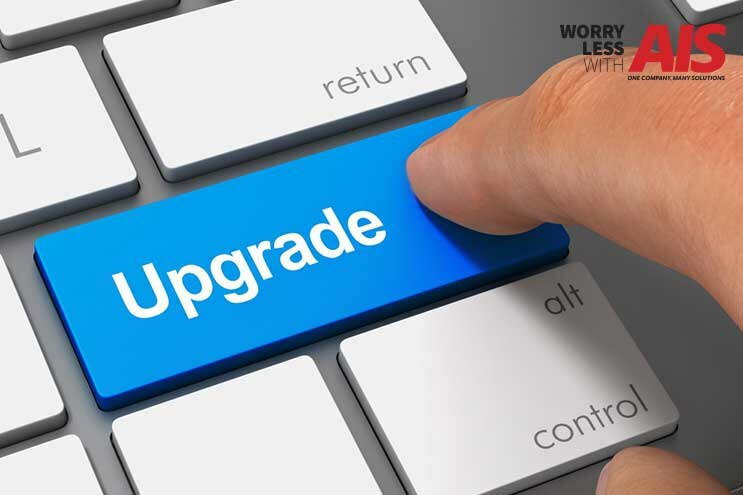 Did you know that if you are still making payments on your current lease, you can upgrade or even switch providers? We’re here to answer these questions for you to make this process easy and pain-free. We promise you’ll be more than pleased with what we’ve put together for you! Over the years, your hardworking office copier has put in the hours to make all of those reports, spreadsheets, and graphics come out in the highest quality for you. Even by taking great care of your office copier over the years and providing routine maintenance, you’re machine still might need an upgrade due to how old it is. Have you or your employees noticed lower print quality lately? Does it seem that even when you change the toner and ink, your prints still come out looking dull or flat? Does this ever leave you with the feeling like you may want to maybe give it a swift kick? This might not have anything to do with how you’re taking care of your office copier. It could simply be old age. Just like your car, over the years of wear and tear affects the way your car runs and how often you might have to service it. Even if you take great care of your car, you can’t do much about the natural aging of time. The same goes for your office copier. If you want better print quality, you should strongly consider upgrading your office copier to fit the needs of you and your office staff. It may even improve some of your office morale. We recently wrote an article on The Top 10 Color Copiers For Small to Medium Sized Businesses that you might want to read. This article is great at explaining the specs and features you might be interested in. The new technology that we see hitting the market nowadays is honestly quite unbelievable. From self-parking cars to thermostats that you can control from your smartphone, the technological advances in today’s digital age are something we are absolutely loving. Why not take advantage of these advances when it comes to your office copier? It would be a waste not to at least learn what these newer models can do for your business. One of the most powerful copy machine models that have made a significant impact on so many different businesses is the multi-function printer (MFP). An MFP is an all-in-one or multi-function device (MFD) which incorporates multiple functions into one office machine. Typical MFPs today can copy, scan, print, fax, and email documents. Additional add-on software allows them to do even more to manage the document workflow and secure documents so that an organization can increase efficiency, control access, or meet industry compliance guidelines. Scan directly to email or network folders. Before we had this ability, it took some time to scan a document, store it on a drive or portable USB drive, and walk it back to your desktop computer to then craft an email and send it. Today, you can do this right at your MFP as long as it has this feature and your IT department has properly configured the device. Convert to Microsoft Word. This feature has diminished the industry of word processing and data entry. MFPs can scan a document, recognize all of the types on the page, type all of the characters, and save it directly to a Microsoft Word document. Convert to PDF. This option is another great time saver. As fast as your copier can scan a document, it can save it into an Adobe Acrobat PDF (portable document format) file for you to distribute to anyone for easy viewing and access. File Encryption. The ability to scan and encrypt a file allows you complete control of who can view or use the file once your MFP has converted it from paper to a digital format. This is a very valuable feature for legal and medical users so that they can protect their clients personal and financial information. Access Control. This feature provides many efficiencies for businesses, including limited access to the machine use, allowing only authorized users to access your device (eliminating use by visitors for devices in open areas), and reducing costs by predetermining which users can use color printing which can be expensive during higher volume runs. If you want to learn about the differences between an office copier and an MFP, read our article, Copier or Multifunction Printer (MFP) - What’s the Difference?. Keeping your business safe and secure should be one of the most important things you focus on. There’s nothing worse than your business getting hacked, possibly losing your valuable and confidential business information and documents. Newer office copiers come with more improved security features designed to prevent unauthorized usage. They also include security features that encrypt or protect the data stored on your device’s hard drive. You can never be “too” safe from online hackers. Does it seem like you or your employees are continually making service calls to your copier repair service to fix your broken office copier? Aren’t you getting fed up with the number of calls each month? The older your office copier is, the more issues and problems it will present to you and your staff. Especially if your business prints, copies, and scans in high demands. Earlier, we talked about copier maintenance and how even though you might take great care of your office copier doesn’t mean it is going to last forever and perform at the best ways you need it to. If you’re always dealing with a broken or inefficient office copier, and having to wait for a service repair technician to come out and fix it, it’s time to upgrade. Over the years, your successful business has probably grown, and more employees have most likely joined you and your team. Employee growth brings higher production volumes on everything in your office, print jobs and document flow are no exceptions. Meaning that you and your employees are probably printing, scanning, and copying more than ever before. Your office copier might not be able to keep up with these tasks as it used to. Your business is not where it was ten years ago as far as production goes, making it challenging for your office copier to keep up with the newer and busier times at your company. Entrepreneur published an article we think you might like to read, Upgrading Your IT Equipment. Even though it might seem more specific to IT hardware, the article gives even more information on the right time to upgrade and of your office equipment and the reasons why you should do so. Upgrading your office copier is undoubtedly a big decision. However, the benefits of doing so can significantly increase productivity and reduce the amount of time you and your employees waste dealing with a broken copier. At AIS, we are here for you every step of the way during your search for your office copier. Whether you need more information on how to choose the best office copier for your business, or you’re ready to make the upgrade today, we’ve got you covered. Contact one of our experienced and highly-trained business technology consultants, here. They are always here to assist you! We’re here to provide you peace of mind that helps you win more business. Worry Less With AIS.